The first fair of the young season is just around the corner. 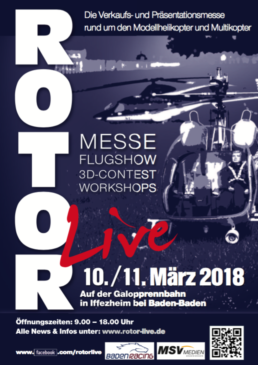 We are at 10.3-11.3. at the Rotor live in Iffezheim (D). On the stand of our European distributor Hacker Motor we present you our modern lighting system. With of course the brand new LightCockpit v2.0 with the matching firmware v2.0. Also in the luggage is a first prototype of the new headlight family “Tina”. It will ideally complement our range of about 16mm diameter between “Laura” and “Lisa”. Trade shows are always an ideal opportunity for us to get in direct contact with our customers. This helps us to make our products even better in the future. We look forward to seeing you at the Hacker Motor stand. Bye for now.